Now a few things to note. Jesus uses Peter’s pre-Christian name foreshadowing Peter’s fall back to old ways of thinking. He also says Simon twice which is a Jewish rhetorical device signifying emphasis and sorrow like when Jesus laments “Oh, Jerusalem, Jerusalem,” in Matthew 23:37. The circumstances of our life that result from sin and the necessity of its cure, grieves Jesus. He is not a doctor working on lab rats. He is a wholehearted and invested physician. Also, the “you,” is plural. Satan desires to sift all the disciples, not just Peter. Furthermore, Satan asks permission. Satan is God’s instrument. Satan only has the authority granted to Him by God. That should put our spiritual warfare against Satan into some much needed perspective. Dualism is a modern sin common in Modern Christianity. Satan is not God’s equal. Satan is God’s errand boy. Also, Jesus grants permission. Why would He do that? Why would a good God allow bad things to happen? To sift wheat means to shake it violently, so that the chaff flows away on the wind and the wheat remains. Now, to be shaken violently does not feel good, but it does purify the wheat. So here is the set up. Jesus tells Peter what is going to happen to Him and what the result will be. But does Peter take it to heart? Does it prevent Peter from going through it? Satan asks to sift Jesus’ disciples and Jesus allows it because He wants us to be shaken, so that we will learn to cling to Him, the immovable rock, the solid cornerstone. That we might experience and know what we are incapable of and what He is capable of. Cancer asks to sift us. Infertility asks to sift us. Doubt asks to sift us. The election asks to sift us. And God grants to them the opportunity to show us our weakness and show us His strength. It is important to understand that Nineveh is the capital of Assyria which is public enemy number one in Israel’s eyes. God uses prophets to lead people to either repentance and righteousness or destruction. Of course Jonah is nervous. What if Nineveh and Assyria actually repents, when northern Israel hadn’t in 150 years? Who would be the instrument of God’s judgment against who? We know what happens of course. The judgment of unrepentant Israel comes a few generations after the book of Jonah. By who? Assyria destroys northern Israel. The judgment associated with Jonah is the spirit of God departing from northern Israel to rest on the repentant Assyria. Assyria’s attack on Israel comes after hundreds of years of God struggling with his wayward people. Covenantal presumption is death. It is the judgment of Israel that God uses to bring the good news to the nations. This points forward to the same situation in Jesus day, but then, God uses the rebellion of Israel as a means to save the whole world. God punishes His people for its complacency. The Lord’s kingdom does not remain with the unrepentant, presumptuous or proud. God sends Jonah into Nineveh with words to save and this points the reader forward to when God will send His living Word into the world to save. The evidence of Chapter 3 reveals that Jonah’s words are powerful because God’s spirit goes before them preparing fields to be planted. The seed clearly goes down and sprouts up quickly, but nothing about Jonah leads us to believe he is capable of such a feat. His words have a power quite above himself. It says in Jonah 3:3 that it’s a three day journey across Nineveh and yet in verse 4 it says Jonah went one day’s journey and his word goes before him throughout Nineveh like a wildfire. In the section mentioned earlier from Matthew, we saw that Jesus referred explicitly to the fish being a sign of His death, burial and resurrection. Death and resurrection are part of our life in Christ. Dying to ourselves is the only way to live for God. Jonah was shown this truth through his ordeal in the fish. Jesus demonstrated it throughout his life, ministry and passion. We must die to ourselves so that we might live for God. Doing the will of the father requires it and it is a sign that points to Jesus Christ. It is a sign that signifies one is a disciple of the living God. So, this is a fairly straight forward and easy sign. 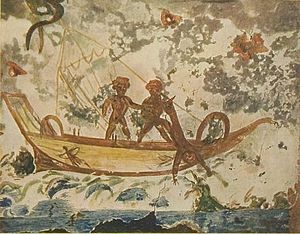 Jonah is swallowed by the Fish and remains in a death like state for three days. He rises on the third day with words of power to speak to the nations. Just like Jesus. Our tale begins with the descent of the prophet Jonah in chapter 1 of the book bearing his name. In verse 3 he “goes down to Joppa;” In verse 5 he goes “down into the ship,” then “lies down” to sleep. This descent places Jonah in the midst of the very people who will sacrifice him for their own salvation in verse 15. This set up alludes to Christ going down from heaven, down to Jerusalem to be crucified and being laid down in the tomb in the sleep of death. 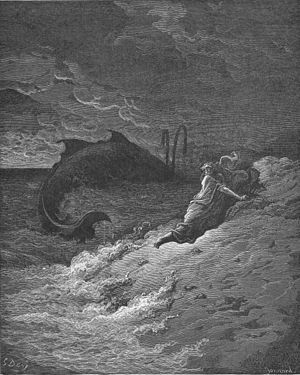 Jonah flees from God and God uses him as a type of Christ. 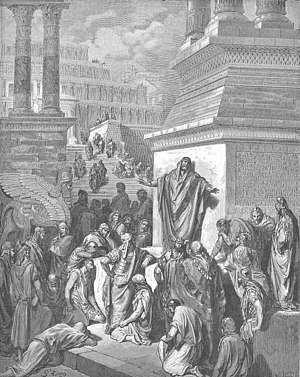 Matthew 12:41The men of Nineveh will rise up at the judgment with this generation and condemn it, for they repented at the preaching of Jonah, and behold, something greater than Jonah is here. Jesus says he is greater that Jonah. Why? Isn’t it self-evident that He is? Why not just say I am great and Jonah is Jonah. We understand Jesus is the greater Moses, Joshua, and David. But who would call Jesus the greater Jonah? Jesus did. We need to get the big picture. Who wrote the book of Jonah? Jonah did. Jonah learned an important lesson and wants you to learn it too. Jonah’s sins were startlingly revealed to him and he took the lesson to heart and wrote a book about it. Jonah is a humbled prophet. Jonah is great because he wrote a book in which God is the hero. Besides pointing the reader toward God’s glory, Jonah is one of the most succinct, dynamic and multi-dimensional “types” of Jesus in the Old Testament. What is the sign of Jonah? A quick read will point us to the fish and the three days of Death, but it’s more complicated than that. To properly interpret the book of Jonah we need to understand that “the sign of Jonah” is the Sacrifice, the fish, the word and the judgment of Jonah as they foreshadow Jesus’ ministry. Author Michael KlossPosted on June 3, 2013 June 3, 2013 Categories Bible, Biographical sketches, Jonah, Sermons, Stories as CatechismsTags Bible, Book of Jonah, God, Gospel of Matthew, Jesus, Jonah, Moses, Nineveh, Old Testament, PeopleLeave a comment on Is Jonah great?